Back in April myself and Nicola took a trip to London to cheer on my brother-in-law Phil who was running the London Marathon. Knowing that we would be spending four days in the capital, we started making plans for some of the restaurants that we would like to eat at. We're both huge fans of Jason Atherton so it was clear that his restaurants would feature heavily in our decision making. After much to-ing and fro-ing, we booked lunches at Social Wine & Tapas and the Michelin starred Social Eating House, however we had to cancel the latter due to me ending up unwell on the Saturday. After an early start, a five and a half hour train journey, a quick check in to The Rathbone Hotel, and short walk (albeit longer than I had initially told Nicola) to James Street, we arrived at Social Wine & Tapas looking forward to lunch. 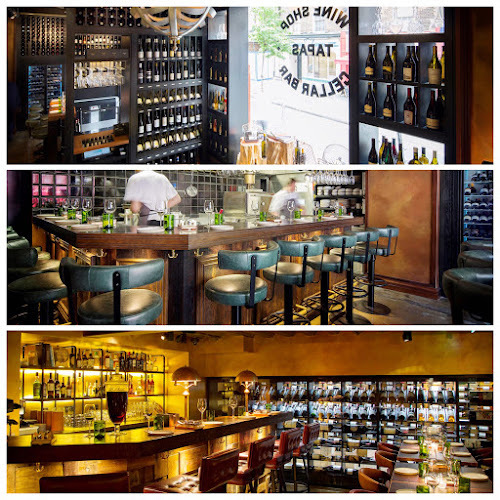 Since opening his first restaurant on 2011, Jason Atherton now oversees 16 restaurants across the globe with a seventeenth venue opening in the Phillipines later this year. 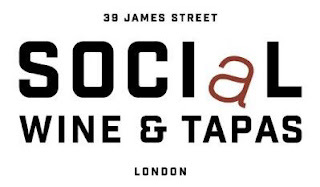 Social Wine & Tapas is one of seven restaurants in London although as soon as you walk through the doors, you could be mistaken for thinking that you were in your favourite Spanish taberna. Set over two floors, the ground floor houses the wine shop and tapas bar, which includes an open kitchen with a dining counter; banquet seating for up to nine covers, and an elevated wine tasting table for 8. In the basement, the cellar bar offers additional seating, a second tasting area, a corner bar and a preparation kitchen counter. We were shown downstairs to a corner table in the tapas bar and left to look over the menu. Social Wine & Tapas offers a fantastic set lunch menu that lets you choose a selection of 5 tapas for £19.50 - we know from our lengthy history of eating tapas that five or six tapas dishes is normally enough to keep us happy so decided that we would share the set lunch with a bottle of wine. cracking bottle of Jane Ventura from Spain's Penedes region. As you would expect from a high end restaurant, the wine list is extensive with prices to suit all budgets, and after much deliberation we chose a bottle of Jane Ventura Blanco Selecció from Spain's Penedes region. Choosing five tapas was difficult but on the end we opted for the follow which were served to the table in no particular order, as and when they were ready. Piquillo Pepper Croquettes - these were fantastic, well seasoned Spanish classics packed with sweet red pepper flavour. Cured salmon, miso, crème fraîche - this was served a bit like salmon tartare. The roughly chopped salmon was bound in the crème fraîche and seasoned with the earthy notes of the miso. This dish was outstanding and we polished it off with no trouble at all. Artichokes with Saffron Aioli - two artichoke hearts sprinkled with hot smoked paprika, chargrilled over the coals and served with a sharp aioli that was rich with saffron. I love artichoke hearts and these were some of the best I've eaten. Confit Lamb Neck with salsa verde - you can confit most meats and the lamb neck that we had was wonderfully tender. The accompanying salsa verde packed a herby punch and had just the right amount of salty capers to cut through the rich confit lamb. Sweet Glazed Pork Cheek, Puy Lentils, Lardo do Colonnato - this last dish was immense. The pork cheek must have been cooked for hours as it fell apart at the slightest touch from the fork. The puy lentils were seasoned cooked and seasoned well, freshened up with a good handful of freshly chopped flat leaf parsley. Thin slices of Lardo were draped over the pork cheek and brought a depth of flavour that I've not tasted in a long time. 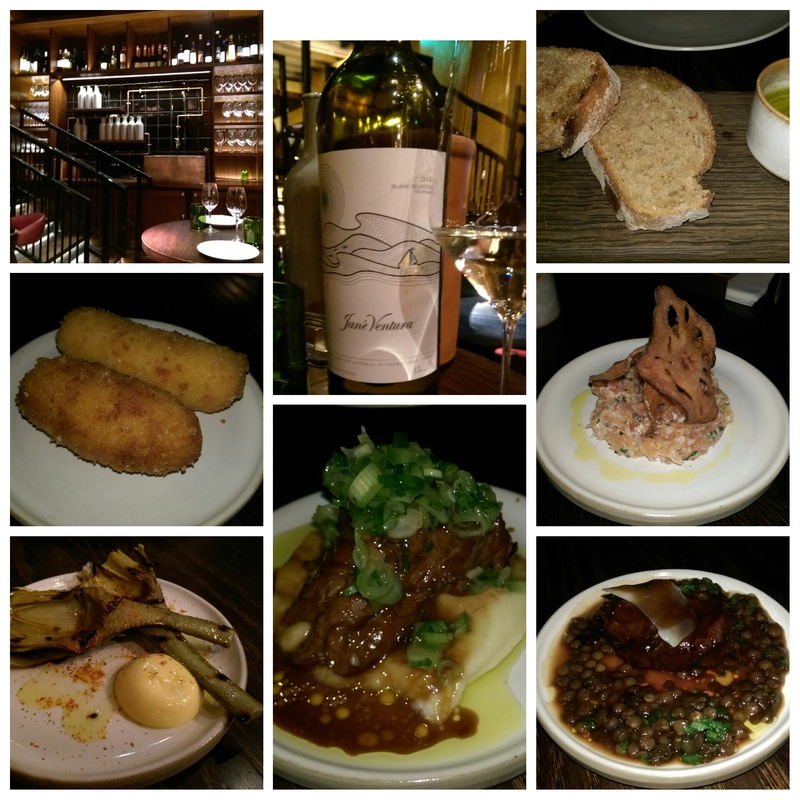 I expected big things from Social Wine & Tapas and I wasn't disappointed. Our lunch came to £51 plus the usual London 12.5% service charge and we both agreed that this was fantastic value for money. The quality of food that we were served was far higher than that of high street tapas chains and the set lunch menu meant that we paid no more than we would have, had we eaten at any of the usual suspects. I wouldn't have any hesitation in recommending Social Wine & Tapas and can't wait to get back our next trip to London. 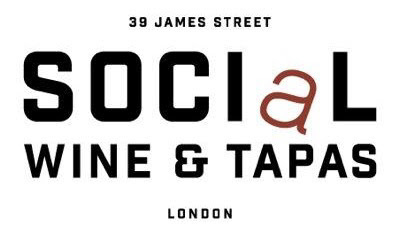 Keep up to date with all the news from Social Wine & Tapas on Facebook or Twitter.